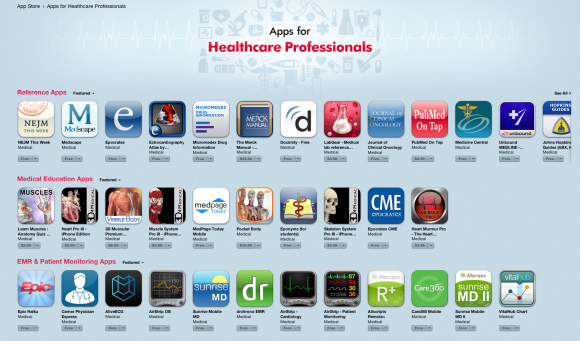 One of the updates to the Apple App Store recently is the inclusion of a specific collection entitled, “Apps for healthcare professionals”. This collection can be found within the ‘Medical Category’. It is a useful starting point for physicians with new mobile devices looking for relevant apps. The collection is further subdivided into: Reference Apps, Medical Education Apps, EMR & Patient Monitoring Apps, Nursing Apps, Imaging Apps, Patient Education Apps and Personal Care Apps. Apple are to be commended for their efforts to categorise the apps within the medical category, which will no doubt help improve future app discovery. However, the introduction of this collection also brings one or two questions that need answering. The introduction of this collection is one of the first ‘app stores’ for medical apps we have seen which offers a basic attempt at categorizing the different types of apps. All of the apps available for the iPhone in this collection are shown below. There are a different selection available for the iPad (not shown). One of the most concerning aspects of this collection is the notable omissions from each of the sections. All the apps included are shown above. Notable omissions include the MedHand reference apps. In the imaging section, there is no mention of Osirix or Monster Anatomy. There is no OSCE/USMLE apps in the medical education section. There are a number of apps which are certainly of the standard required to be showcased here and it is a shame to see their omission. It is arguable that some of the categories healthcare professionals need aren’t included here. This includes things like drug apps (beyond the inclusion of epocrates and micromedex), medical calculator apps, journal apps, procedure apps and so on. How are apps selected into this collection? This is important as it gives certain developers an unfair advantage over others potentially stifling innovation in a crowded ecosystem. For example, there are many very good reference applications out there which were not selected. It is important to establish if there is any conflict of interest from either pharmaceutical companies, publishers or others which may not be acknowledged in the collection. Who verifies the apps selected? A number of apps have been shown to be inaccurate or unsuitable for use in healthcare settings by academic researchers. It is vital to know whether or not this collection is curated by someone with medical knowledge who could potentially pick up on unsafe or dangerous apps. One of the important aspects of medical application usage in clinical settings is the role of regulatory bodies such as the FDA or MHRA. I noted that while there were some apps that have received FDA approval, this was not mentioned at any point. I don’t want to appear skeptical of the utility of a collection for healthcare professionals as I strongly believe that tools like this will ultimately improve the uptake and use of medical apps amongst professionals. However, I do think it is important that clinicians are able to rely on the apps chosen to be suitable for use in healthcare settings and therefore, Apple needs to acknowledge any confounding factors. At this stage, the number of apps in this collection is small and any implications of the above will be limited. Although, as the medical app ecosystem continues to evolve, and the number of apps increases, so we may need to see acknowledgement and resolution of some of the above issues. I agree with all your points Tom; they’re very valid. Thats interesting that they vary by country. I didn’t realise that. I think you raise a very valid point about what is a medical app and how does it differ to a healthcare app. I think that searching for a definition could turn into a bit of a farce like the definition of ehealth which one paper showed had 50+ seperate definitions – http://www.jmir.org/2005/1/e1/ Overall though I think it could help the community if definitions were clearer. My biggest gripe is the age. Most of these apps are over a year old. Many of them STILL aren’t even formatted for the iPhone 5! Some of them haven’t even been updated in the past 2 years! For all their dough, you would think they could supercategorize all medical apps. Their initial lack of organization of medical apps, seems to me, to have created a market niche that Happtique, and you guys are gladly filling. For once, Apple is late to the dance, almost seem as if they are disinterested, which is understandable. The suits at Apple, probably look at the bottom line, wiith Medial Apps garnering a very small pecentage of what they can earn with their innovative hardware, and their inevitable lauch of the iWatch, probably in the next year. agree. don’t really blame them for not trying in this area. Interesting discussion. Knowledge is power and the increased accessibility of in your pocket fingertip information is empowering to those allied health professionals who do not have the financial means to make investments in purchasing expensive medical tomes or participate in high profile professional conferences. There is a need, however, for those in academic and leadership roles to objectively vet these resources according to established scientific criteria. This is a good launch. Please, how can one make a bulk purchase of these ipad apps in one collection and download. Good step but not worth of Apple. The way I see it, apps are Apple or Android based. You provide the platforms ( phones, tablets,etc) and then open the door to developers…then you create an “app-library”… WELL, you should be a good “librarian”: organize, categorize, select, guide- help the user make the best “use”possible of your collection, so that they not just have a good experience, but in the case of health apps, a productive and SAFE one. It should not be about selling them (which I don’t think it’s the goal for them here, obviously), but about achieving Apple “standards”. When one goes to Apple, is because you know you are getting “the best”. I could not find this collection in the Brazilian store. Is it only for US App Store? I have published three apps for medical use and I would like to see if they appear. Great review. How about user selection/votes from QUALIFIED medical professionals? No where would a user ranking system be more important perhaps than to allow MDs to evaluate these apps and vote (as MDs) on their usefulness. When we launch our new website in two months — we’ll have this feature in place — think it’ll make a huge splash.